Let’s face it the last thing you want to think about when moving house is cleaning your old one, but if you want to be sure of getting your bond back then you’re going to have to don those rubber gloves or hire a professional cleaning company to do it for you. 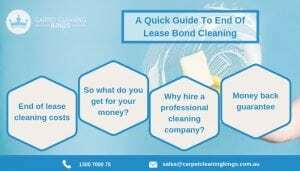 Unless you leave your rental property clean and tidy as you received it, then you may have to forgo your bond, and since that probably equates to at least a month’s rent, is that money you can really afford to wave goodbye to? Sometimes you just have to spend money to save money and that’s certainly the case when hiring a cleaning company. Some will charge by the hour whereas others will offer an all-inclusive package. Here at Carpet Cleaning Kings, we offer a basic bond clean with an inclusive price starting from just $140 for a 1 bed 1 bath property. If you want a more comprehensive clean then we list several areas which you can add to your basic clean at an additional cost. Our basic clean covers a top to bottom scrub of your property including the all-important oven and toilet. It also includes areas such as fans, air conditioning units, skirting boards and ceilings. Prices naturally vary according to the size of your property. You may think that you can do the cleaning yourself but it’s far harder and more extensive than your typical weekly clean. In addition, you’ll often have to clean appliances and fixtures that you may never have touched before such as the ceiling lights which are full of dead insects ugh! Why spend the entire weekend scrubbing and cleaning when you can hire a professional to do it for you. Not only will they work smarter and harder than you, but they know the sort of things that landlords and real estate agents are looking for in a clean, and they’ll be sure to deliver. You can use the time more wisely by getting on with packing your possessions and making those all important change of address phone calls. 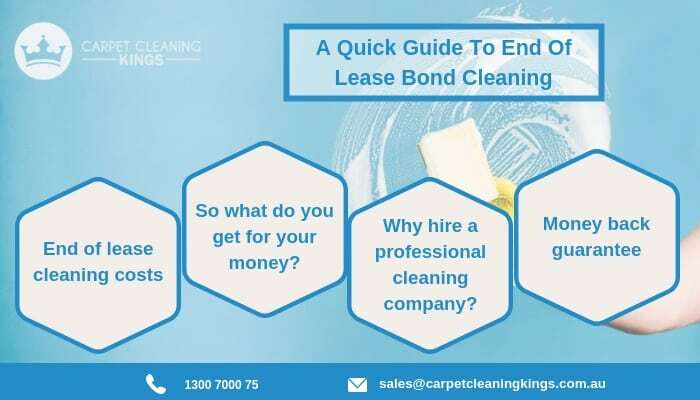 Most companies offer some form of monetary compensation in the event that you do not get your full bond back and most should readily return to rectify any cleaning issues. Hiring a professional cleaning company will save you money in the long run and once you’ve paid us you won’t need to open your purse anymore. Instead, you can spend your reclaimed bond money on those little extras to make your new pad feel like home. If you’re in need of bond cleaning then give us a call on 1300 7000 75 to see just how we can help you.